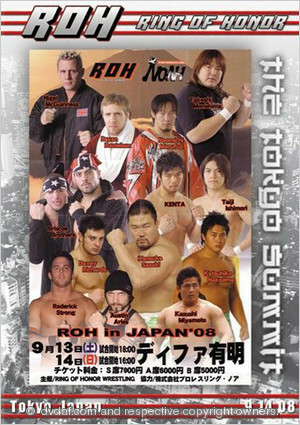 Of these four guys I only know Kotaro Suzuki because he appeared at ROH’s Live in Tokyo. This is a NJPW (Naito & Yujiro) vs. NOAH (Hirayanagi & Suzuki) match. There’s no commentary and I’m not really familiar with these guys so I truthfully don’t know which one is which. It’s pretty much a brawl to start, with the referee exerting very little control. The NOAH team controls the early going. Whichever guy from the NJPW team that takes a beating almost makes several comebacks but gets thwarted a couple of times. They fight on the floor briefly and then go back to the ring for more stuff. The NJPW guy finally makes the comeback and tags his partner. He hits a suplex on one opponent and a nice pump handle powerslam on the other for a near-fall. That doesn’t last too long, as the NOAH guy pokes the referee in the eyes just so he can kick his opponent in the balls. The NOAH team is back on offense now. The momentum shifts back and forth a few times, and two of the contestants fight on the floor for a minute. The NJPW team gets an opportunity for a pin but they pull the guy up at two, and then one of them hits a sky twister press to get the pin at 11:29. I seriously wish they had done commentary, because I have no idea who these guys are or why they continue to fight after the bell. Aries attacks Black before he can even make it to the ring. He throws Black around the ring and rolls through a sunset flip and they slide to the entrance ramp where Aries locks on the Last Chancery. Aries fires up the crowd and goes to the top rope, and Black knocks him down. They fight on the floor, and Black throws Aries into the guardrail and slams his face on the ring apron. Back in the ring Black stays on offense for a bit. He works on the lower back, using various strikes and submissions. He goes for the Buckle Bomb but Aries counters it to a rana. He takes Black down and hits the pendulum elbow. Aries stays aggressive and tries the dropkick in the corner, but Black catches him and slams him down, and then hits the Buckle Bomb for two. Aries moves out of the way of a Phoenix Splash and hits the kneebreaker/back suplex combo, and then connects with the dropkick in the corner. He hits the brainbuster with no effort, thus forgetting to sell his supposedly injured back. I wonder why more people don’t notice how overrated this guy is. Aries goes up top and winds up with a sunset bomb. He hits the kick to the head and another brainbuster, and rolls that into the Last Chancery. Black unfortunately has to tap out at 11:06. The back and forth action was all well and good, but Aries’ refusal to sell hurts Black more than it helps. Jimmy Jacobs comes out to attack, locking his nemesis in the End Time. He promises more chaos and a new ROH World Champion tonight. Miyamoto wrestled on Final Battle 2003 and was on a couple of ROH shows back in 2004 as The Great Kazushi (one match against Shawn Daivari that never made it to DVD). He represents New Japan. They trade boots to the face right away and Edwards wins that battle. He gets a few impressive moves in but can’t keep Miyamoto down. Miyamoto makes the comeback and hits a superplex for two. Edwards comes back and hits a powerbomb into a folding press for two. Miyamoto hits a big clothesline for two. He follows up with a brainbuster and then goes after Larry Sweeney on the apron. Sweeney accidentally hits Edwards and Miyamoto rolls him up for the win at 5:07. Edwards got almost all the offense in until the cheap finish. This seems to build more heat on a rift between Edwards and Sweeney, but they hug instead. The match never got much time to become anything. I understand that these two have wrestled before, and to some acclaim. Ishimori is from NOAH. Both men waste no time showing off their speed and agility. Generico gets a quick takedown and Ishimori bails. Back in the ring he gets a takedown and Generico bails. They trade holds back and forth; Generico gets a tilt-a-whirl backbreaker for two. Generico controls the action briefly, until Ishimori fires up and hits a series of moves that sends Generico to the floor. He follows him out with a high moonsault out to the floor. Back in the ring Generico recovers and hits a suplex into a Michinoku Driver for two. Ishimori comes back with a springboard rana off the top rope and a German suplex with a bridge for two. He goes to the top and Generico pops up there and tries a super brainbuster. Ishimori instead hits a sweet tornado DDT, which Generico then no-sells in order to hit the running Yakuza kick for two. He then hits a Michinoku Driver for two. Ishimori comes back with a crucifix bomb for two and then a modified DDT for two. He slams Generico down and hits the Superstar Elbow for the pin at 12:22. They did some good back and forth but I’m growing weary of Generico’s no selling ridiculousness. Richards and Jay start the match with some back and forth maneuverings. They fight to the standoff and the Japanese fans applaud for that spot just like the Americans. Morishima gets tagged in and the Briscoes have to double team him to take the advantage. He recovers long enough to tag Richards in, but the Briscoes are soon working him over. Richards drives Jay into the corner and tags Morishima in. Jay then does the exact same thing with Morishima. The Briscoes try to suplex Morishima but the big man suplexes both of them instead. All four men come in and the Briscoes attempt simultaneous sunset flips but both get sat on. Richards and Mark go to the floor and Mark gets dropped neck first on the guardrail, and Sweeney gets his shots in too. Mark gets dominated for a bit and several hope spots later tags in Jay, who gets a little too much offense on Morishima I think. Jay hits a Missile Dropkick that Morishima stood there and waited to take. The match just continues to do back and forth with no real flow or build to anything. The match breaks down to a big brawl and Richards is able to hit Mark with the Alarm Clock to get the pin at 12:00. That move, really? I was really looking forward to that match but I was sorely disappointed. I don’t mind Richards going over, but with a transition move? And the match itself had no structure whatsoever, so no momentum could be built to any kind of comeback and therefore the match lacked fire. Kanemaru is the most prolific GHC Junior Heavyweight Champion by far; he’s held the title four times for a total of 1,121 days. They wrestle on the mat to start, trading control back and forth. Danielson cinches on a headlock pretty tight. Kanemaru escapes that so Danielson goes after his arm and wrist instead. That doesn’t last too long though, as Kanemaru dropkicks Danielson to the floor and executes a cool looking guillotine legdrop onto the guardrail. He hits a DDT on the floor and Danielson is down. Back in the ring Kanemaru stays on offense, wearing Danielson down. He hits a DDT for two and keeps working on the neck. Danielson recovers and hits a series of forearms and goes right back to the arm. He even locks in a Triangle Choke but Kanemaru won’t give it up. Danielson tries a cover instead but only gets two. Kanemaru comes back and hits a missile dropkick for two. He hits a swinging DDT and Danielson kicks out. He follows that with a leaping DDT off the second rope for another near-fall. Danielson reclaims control but can’t quite put the champion away. They continue to trade control back and forth for a bit. Danielson is finally able to subdue Kanemaru enough to lock on the Cattle Mutilation to win the title at 20:39. I don’t know much about Kanemaru but I know he knows a lot of DDT’s. The match flew by and had lots of good stuff from both guys. Danielson is presented with the belt and a trophy. Backstage he gets interviewed while photographers snap pictures. He announces that he will defend the title against Katsuhiko Nakajima next week in Philadelphia. The segment drags on forever but the match was great. This match features a wrestler from DDT (Ibushi), two from NOAH (Marufuji and KENTA), and one from Kensuke Office (Nakajima). Marufuji and Ibushi start it off with some back and forth action. They do the standoff audience applause spot. They each tag out to their partners, who trade stiff kicks, I would think to the surprise of no one. They do a standoff audience applause moment as well. KENTA tags Ibushi back in, and Marufuji and Nakajima isolate on him in their half of the ring. Ibushi makes a quick comeback and tags KENTA in, and he works over Marufuji. KENTA tags Ibushi back in he takes a couple of kicks before putting on a reverse chinlock. Nakajima comes in to break that up. KENTA comes back in and throws kicks at both his opponents. Marufuji dumps KENTA to the apron and Nakajima kicks him down to the floor. They get back in the ring and Nakajima continues to work KENTA over. All four men get in the ring and fight over a double suplex. KENTA and Ibushi suplex their opponents onto the top rope, and hit double flying knee strikes off the top rope. That gets a two-count on Nakajima and tags in Ibushi. He and Nakajima exchange kicks. Ibushi wins that battle and gets a two-count. Nakajima fights back and hits a nice missile dropkick and tags Marufuji. He hits a flying elbow for two. Marufuji takes Ibushi to the floor, where Nakajima kicks him down. He drops Ibushi head first on the ring apron and then whips him into the barricade. Ibushi takes several more minutes of abuse before making the hot tag to KENTA, who is on fire. Nakajima comes in and he and KENTA slug away at each other. This is all back and forth action; I can’t recap it all. Bobby Cruise announces that one minute is left in the time limit. And of course, the time limit expires with no winner at 30:00. The crowd wants five more minutes, and they actually get it. I hate that. Marufuji and KENTA start by kicking each other a lot, and KENTA hits a big clothesline. He follows up with a sit-out powerbomb for two. Marufuji comes back and hits the Shiranui but Ibushi breaks it up. He goes to the top rope and fights KENTA off, but then gets kicked in the head by Ibushi. KENTA runs back top and hits the Super Falcon Arrow and Nakajima breaks that up. Ibushi hits a Phoenix splash on Marufuji but he’s not the legal man. The 5:00 overtime period passes with still no winner. So thanks for adding the five more minutes, since it didn’t make a difference. A lot of people are going nuts for that match, but while the action was fun there was nothing to get emotionally invested in. The overtime period was pointless. McGuinness has been the champion since 10.6.07, and this is his twenty-fourth defense. Jacobs attacks the champion right at the bell, thus setting up the heel-face dynamic for the match. McGuinness withstands Jacobs’s early attack and begins to frustrate the challenger. Jacobs walks up the ramp to regroup. Back in the ring they trade holds, with Jacobs going after the leg and McGuinness countering with his British style. McGuinness tries the headstand mule kick, but Jacobs doesn’t fall for it. In fact, he manages to maneuver the referee out of his way so he can kick the champion in the balls. That gets a two-count. Jacobs uses a chain to cement his early advantage over the champion. They battle on the floor and Jacobs uses everything he can to his advantage. They fight on the ramp and Nigel tries a running lariat but Jacobs spears him out of the air. He rolls him back to the ring and gets a two-count. They trade control back and forth, with the crowd supporting the ROH World Champion, which is a bit unusual under current ROH circumstances. McGuinness tries a Jawbreaker, but Jacobs catches him in the End Time. The champ reaches the ropes, so Jacobs gets desperate and goes back to the chain he has hidden on his person. The champion won’t stay down though, and he fires up and hits a lariat for two. Jacobs gets the chain out again but McGuinness connects with the Jawbreaker Lariat first to score the pin at 21:03. That seemed a little bit long for what they were doing, but I loved all Jacobs’s heel antics and they meshed with a babyface Nigel very well.